As you probably know, War Horse is a play based on the book by the children’s author Michael Morpurgo. Created by the National Theatre, War Horse is a compelling play that first premiered in 2007 and is now performed all over the world. War Horse tells the story of a boy named Albert and his beloved horse Joey. Set during World War One, Albert’s father sells Joey to the army as he is in need of money resulting in Joey being sent to France. After suffering treacherous conditions and enduring exhausting pressure, Joey is found trapped in barbed wire in the middle of no mans land. Four years later he is freed and returns to British lines, which is where Albert is a soldier in the war. Albert suffers from a gas explosion and is temporarily blinded so ends up in an army hospital. There is a tear-jerking scene in the book where Albert and Joey are reunited and although Albert is blind he recognises his treasured horse Joey. As a huge lover of books and theatre I am always intrigued by shows that go from page to stage. I much prefer a stage adaptation of a book rather than a film adaptation because theatre is magical. Theatre allows you to delve deeper into the characters as you see a different perspective of the story. Having won numerous Olivier and Tony awards it seized the spot of one of the most famous plays on the West End. Despite the fact Morpurgo originally doubted its success as he didn’t rate his own book very highly , its stunning use of puppetry tells the story flawlessly. 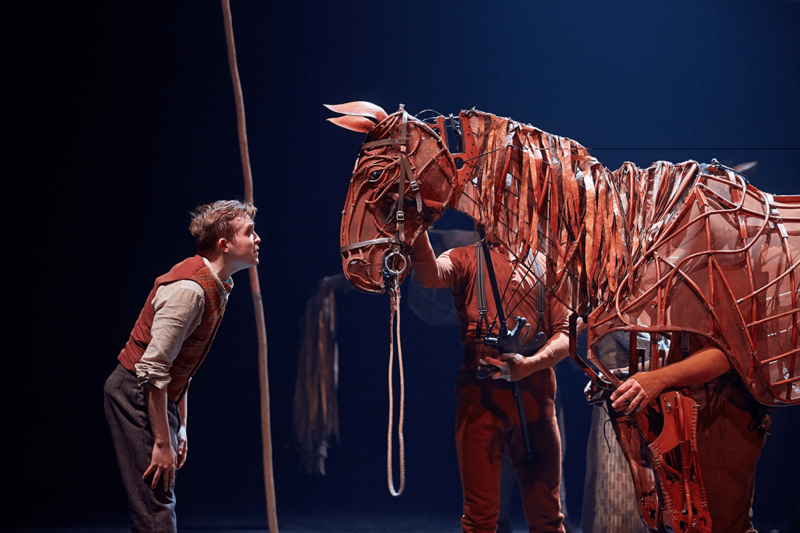 Recently War Horse on stage did a social media Q&A with the author Morpurgo, fans of both the book and the stage show asked him questions on his writing inspiration and thoughts on the play. I myself am not a huge fan of horses, I was never into horse riding and therefore was never tempted to see or read War Horse. However I was interested in Morpurgo’s inspiration to write a book about horses, in the Q&A he is asked why. Morpurgo was right, before I’d seen the play I didn’t realise the strength of the bond between horses and their owners. The story centers around the relationship between Albert and his horse Joey as he trains him up for the farm, watches him grow up and then have to deal with his father selling Joey to the army. The puppetry brings Joey the horse to life which I would find a lot more emotional as opposed to reading the relationship in the book. It’s not as much a story about horses but a story about friendship. He was also asked what his favourite scene from the book is and how he feels it is interpreted on the stage. Moments such as the one he described are usually significantly touching in a book, it is a moment of clarity and the reader restores faith in a happy ending. This is similarly portrayed on stage and Morpurgo mentions how it lifts the play, it must be a tremendously heartwarming moment for the audience after connecting with Joey and Albert’s relationship. 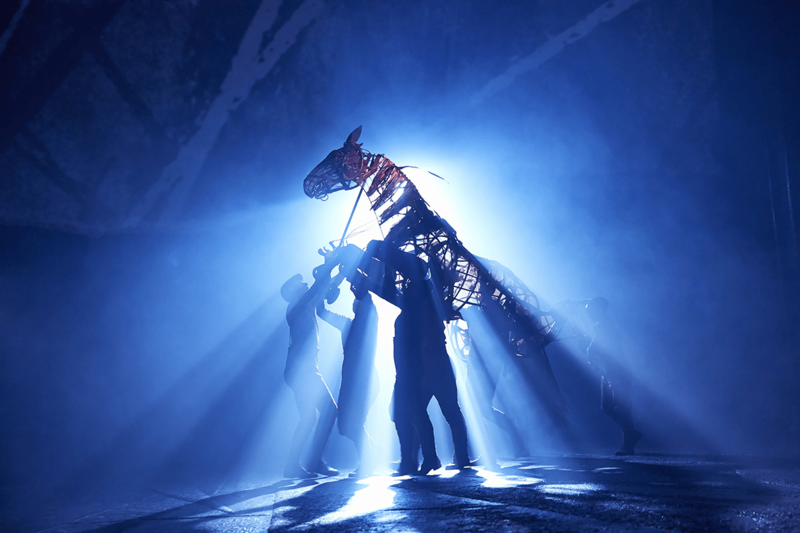 The puppetry in the play cannot be described as anything less than phenomenal, the way the horse moves so elegantly and authentic enables the audience to forget that the horse is merely a puppet as it is truly brought to life. Morpurgo was asked about his reaction to seeing Joey onstage for the first time. I watched an interview with Morpurgo and he said that he laughed at the idea of turning the book into a play and having the horse as a puppet. He had the idea that it would resemble a pantomine style horse and lose the seriousness and emotion that is supposed to be conveyed by Joey. Actually the whole idea for the play was after the Director discovered a puppetry company in South Africa that made outstanding puppets and he wanted to create a play where the central character was an animal. After Morpurgo was shown a video of the puppets he was in awe and instantly agreed to the production. The theatre brings stories to life and War Horse certainly does that. There is something very enchanting about seeing a story you know and love so well, and characters you’ve connected with on the stage in front of you. You can read more of Morpurgo’s answers to the social media Q&A on the War Horse website here. It appears that the book has been very well adapted to the stage and I look forward to seeing it one day. I was lucky enough to see War Horse in London this week and it was wonderful. The large cast were magnificent and the horses were fantastic, you really felt for them, you really believe they are alive. It was quite harrowing in places and I shed a few tears at the end. Well worth the trip to London. Only just caught up with your review Amy and after reading I’m so happy that the play is to be held over till at least Feb 2016 in London. I was interested to read in your piece that the director was inspired by a puppetry company in South Africa. In April 2015 the Canadian Stage Company in Toronto held a Spotlight South Africa event comprising plays, music, dance and included an incredible piece called Ubu and the Truth Commission, the acting and puppetry both moving and memorable. Looking forward to reading your next review, there’s nothing like experiencing a live play or show.